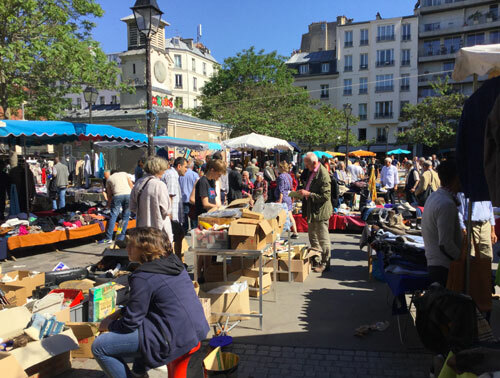 Marche d'Aligre is one of the lesser spoken about flea markets in Paris, in fact no-one ever told me about it, I found a small mention in a magazine years ago. The three well known markets (more info on those below) are all next to the periferique, the main road that circles Paris and they are all weekend markets - some are open Monday too - but the brocante at Place d'Aligre is open every morning except Monday so you have more opportunity to visit it. 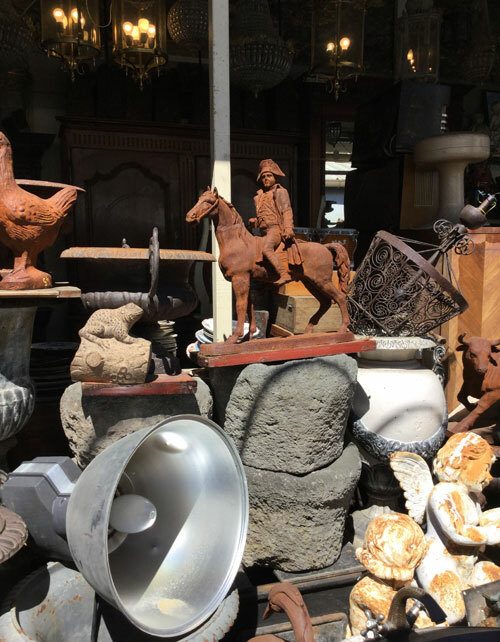 At first it looks like alot of antiques but get further in and there are stalls like this with boxes and boxes of stuff - far more promising for bargains! This market shares the Place with an amazing fresh food market and an indoor food market. 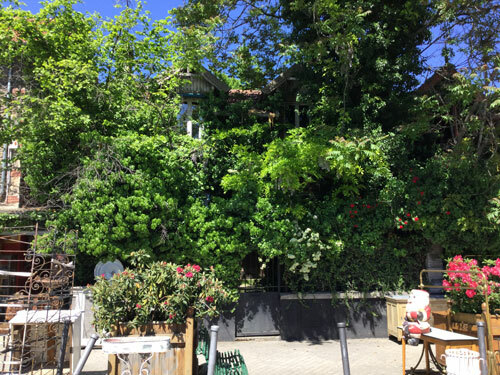 There are cafes around so it's a good morning out with lots to look at and buy and a coffee stop; it's about 5 minutes walk from Metro Ledru-Rollin on Line 8, a little south east of the Bastille area in the 12th arrondissement. I can really recommend a morning in this neighbourhood. I went on a Tuesday that was actually a public holiday (victory day) and lots of places were closed so I was happy to turn a corner and find everyone busy and working as normal. 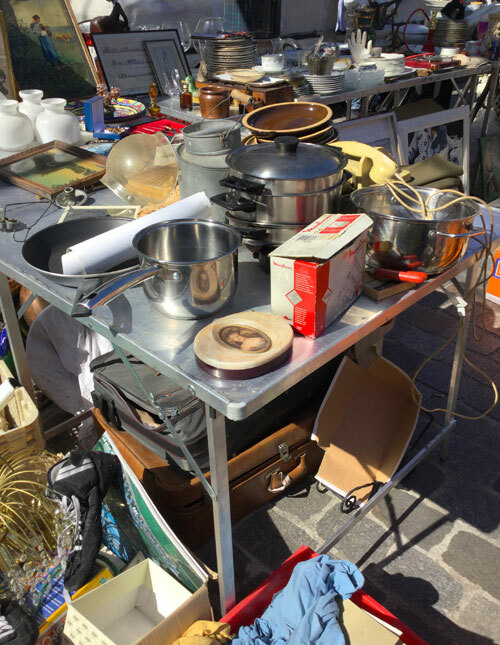 I really like the grubbier markets because I'm looking for old kitchen stuff for my work and so the Marche aux Puces at Porte de Montreuil in the south east is a favourite. 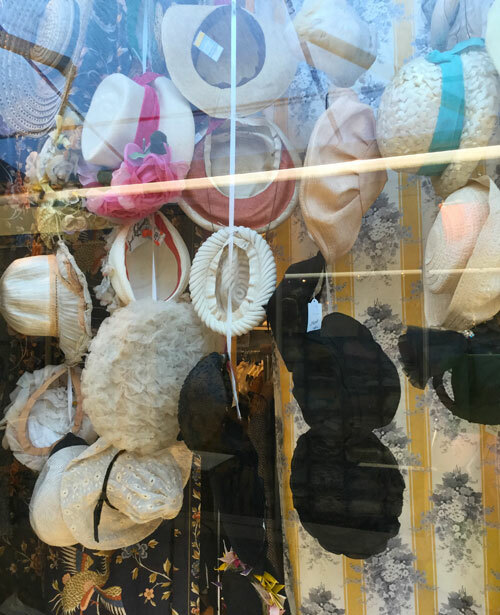 It's open all weekend and Monday though most will pack up at Monday lunch time. Warning - This is not picturesque Paris. 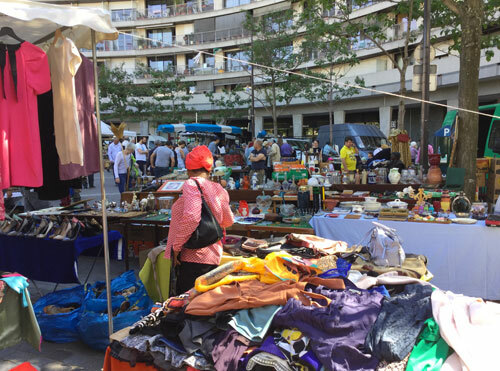 Go to Porte de Montreuil metro, line 9 then walk east (follow the crowds) on the left around a portion of a huge roundabout (Place de la Porte de Montreuil) and you'll come off at the start of some stalls. 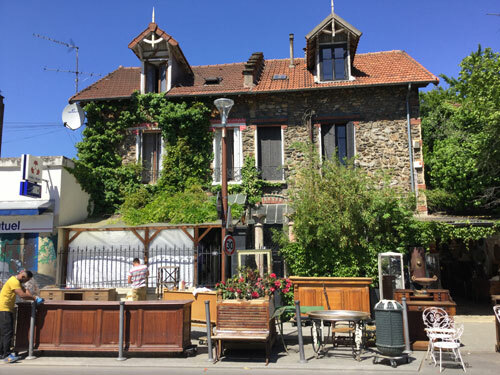 For the brocante walk down it's hill, turn left and follow the bottom aisle all the way north til it ends - the other aisles are all new stuff. When you get to what appears to be the end do continue 40 yards or so up Avenue Gallieni as there is a yard on the right with alot more stalls; proper scruffy stuff here so good for a proper rummage. I found quite a few things for my work here. 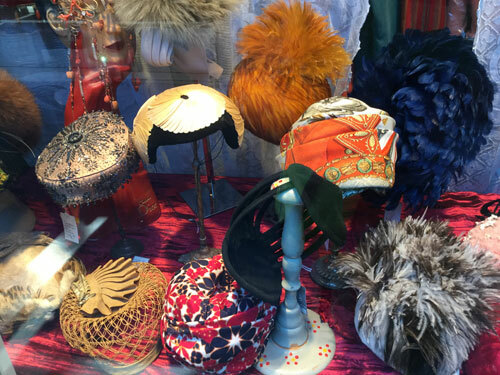 There are no collectibles and trendy stuff up this end, it's like boxes of stuff found on the streets or from house clearances so it's not chic at all and regular tourists would not come here. 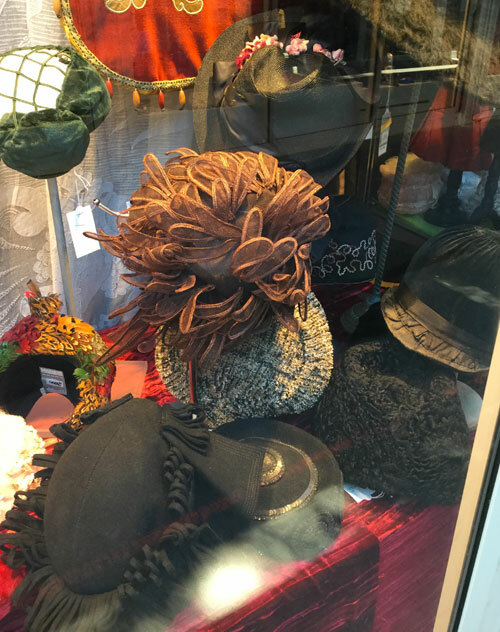 I read some reviews on the link and see some people felt scared here and one got pick-pocketed - well you need to be careful of that in every big city but yes this is more edgy and may not be for you but I've always felt fine here as I don't look like a tourist or ever have a ladylike handbag etc. There is plenty online about this the most famous flea market in Paris so I'll not write too much but you need to get to the heart of this market and then go to the west end of it where the real bargains are; the banana boxes of junk but at the high end there are shops of ornate baroque furniture so this place has an amazing range and feast for the eyes. 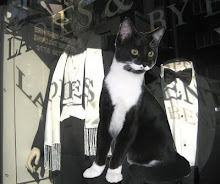 Orientate yourself from Rue des Rosiers. I love the Marche Vernaison off that road but it's too expensive for me though lovely to look at everything here. I love these town houses on one of the roads near here, the whole market is like a small town itself. 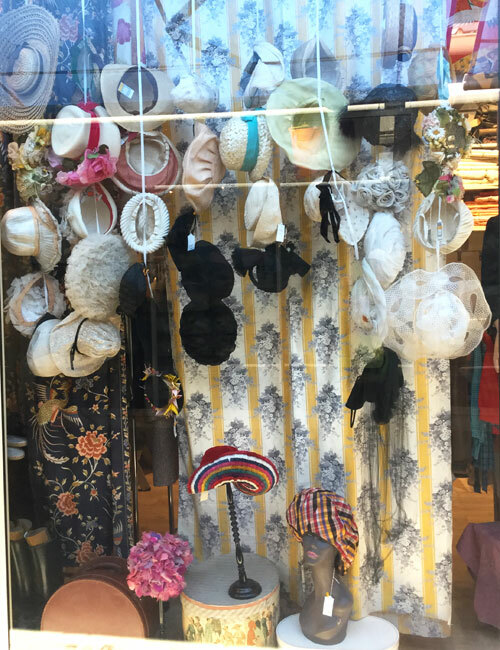 I wouldn't say I'm a hat person particularly but I couldn't resist the displays in this shop. 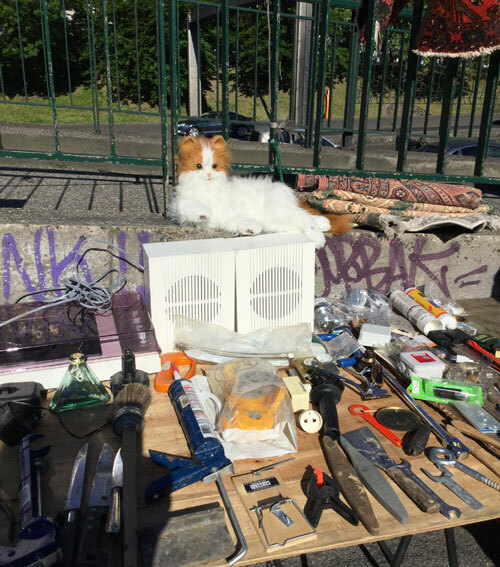 And if you come here be sure to have lunch at the amazing La Recyclerie which is right by Porte de Clignancourt metro line 4, the market is 5 or 10 mins walk from here. 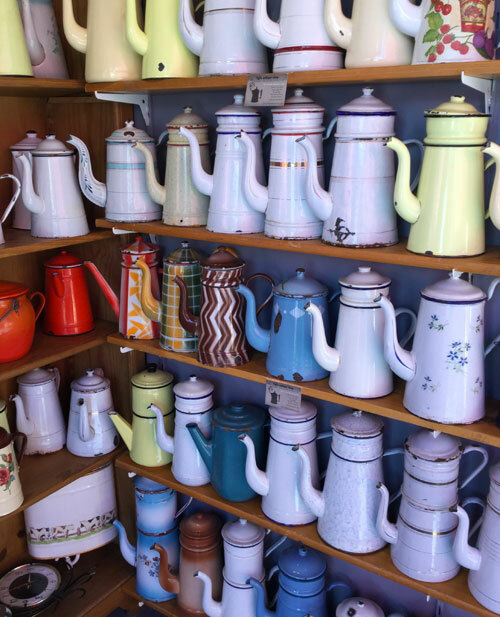 These coffee pots were in the Marche Vernaison; there are many named markets within the whole market area. 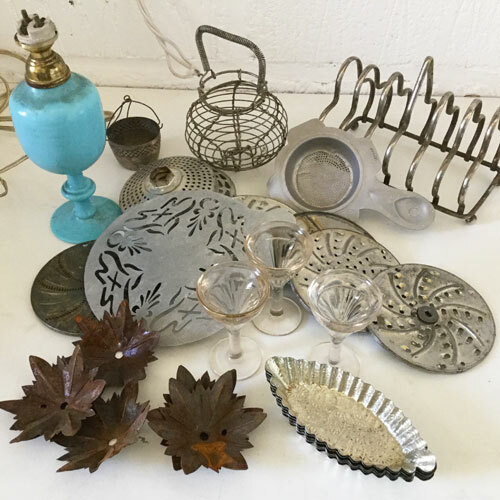 And here are some of my finds from across these three markets. I presume the bigger metal disc is a stencil to sieve an icing sugar pattern on a cake - I may even use that in my kitchen! I cant wait to rewire the little turquoise glass stand and see if I can do something with that. 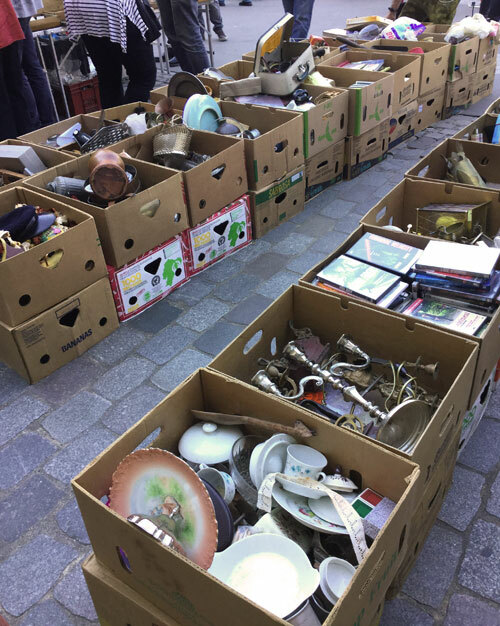 I only ever went to Porte de Vanves market in the south once, (Sat/Sun only) it was mostly antiques, hardly any bargains so I never gave it another go, but it's great to look at and maybe there is a bargain in there somewhere.